I’ve often wondered what inspires people to take an interest in the environment. My husband Doug and I recently went on a tour of the Bamberger Ranch in Austin, Texas. J. David Bamberger has invested his self-made fortune into restoring the habitat on this ranch. The land had been severely neglected. There was little left in the way of diversity in plants or animals. For example, there were just 48 species of birds. After decades of overgrazing and wildand fire suppression, native grasses had given way to thirsty juniper trees. There were no live creeks or surface water left on the property. Seven wells drilled 500 feet deep failed to produce even a drop of water. 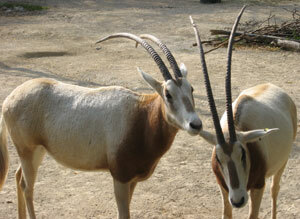 A herd of Scimitar-horned Oryx roams grassland at the Bamberger ranch. These animals are extinct in their native Africa, but Bamberger is partnering with the San Antonio Zoo to help preserve the Oryx gene pool. Wikimedia Commons photo. Today, this working ranch is home to more than 190 species of birds, including many endangered species. It also hosts a man-made chiroptorium where more than 100,000 Mexican Free-tailed bats roost and breed. Ponds and lakes are fed by countless springs. Miller Creek flows year round, even during droughts. Bamberger has permanently protected the 5,500 acres of his ranch from development. The ranch is dedicated to environmental education, conservation and research. I was curious as to what inspired Bamberger to make choices like these. Bamberger’s father had been a poor farmer in Ohio. His mother loved nature. It turns out that when he was a teenager, Bamberger’s mother gave him a book that changed his life. That book was Pleasant Valley by Louis Bromfield. It explained how a damaged piece of farmland in Ohio was restored through sound soil management practices such as crop rotation, using manure fertilizer, and controlling erosion through contour plowing. Bromfield’s innovations were the forerunners of sustainable agriculture, defined as a “management-intensive method of growing crops at a profit while concurrently minimizing negative impact on the environment, improving soil health, increasing biological diversity, and controlling pests.”The book might seem dated to today’s readers. But Bamberger encountered it shortly after the Dust Bowl had ravaged the Midwest. After finishing the book, the young Bamberger said, “If I ever make money, I want to do what Bromfield did.” When he grew rich selling vacuum cleaners and then investing in fast food restaurants, Bamberger sought out land that needed restoration. In 1969, he bought one of the sorriest pieces of land in the Texas Hill Country. He called it Selah, after a biblical term inviting a reader to “pause and reflect.” Bamberger spent decades restoring ecological balance to the abused property. When he began his restoration work, he was widely ridiculed. Today, he is considered the father of “a movement in Texas which has transformed literally millions of acres. It is the finest model of land conservation,” according to Andrew Sansom, former Director of the Texas Parks and Wildlife Department. Bamberger’s habitat restoration projects have been recognized by numerous awards from the Soil & Water Conservation Service, National Arbor Day Foundation, The Nature Conservancy, etc. Next week’s article will deal with how the self-absorbed Me Generation can become the We Generation. The Fearful Dog, Drs. Suzanne Hetts and Daniel Q. Estep.